Roll Up Gallery, 1715 SE Spokane St. I am so very proud to present this event that my incredible team and I have been putting together for art and sculpture enthusiasts. 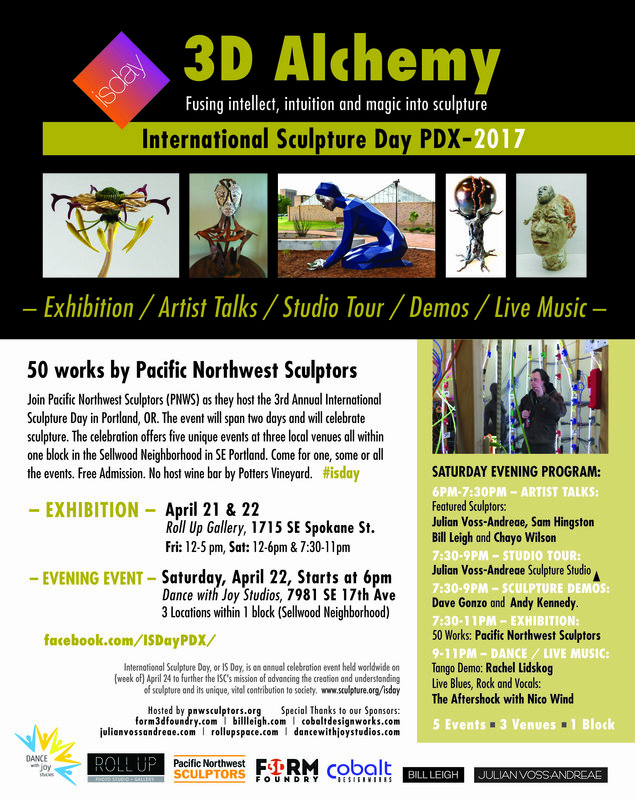 Please Join our group Pacific Northwest Sculptors (PNWS) as we host the 3rd Annual International Sculpture Day in Portland, OR. The event 3D Alchemy – Fusing Intellect, Intuition and Magic into Sculpture will span two days and celebrate sculpture. The Love Brigades Procession will lead guests safely and joyously dancing to music between events on Saturday evening! STUDIO TOUR: Tour the studio of Julian Voss-Andreae and see his process of 3D scanning, printing and digital sculpting while he unveils his public work in process for PCC. SCULPTURE DEMOS: Witness drawing with fire & metal by sculptor Dave Gonzo and ceramic soul diving by sculptor Andy Kennedy. DANCE: Finish the evening with a Tango Demo by Rachel Lidskog of Dance with Joy Studios and get your groove on with live music from The Aftershock with Nico Wind. 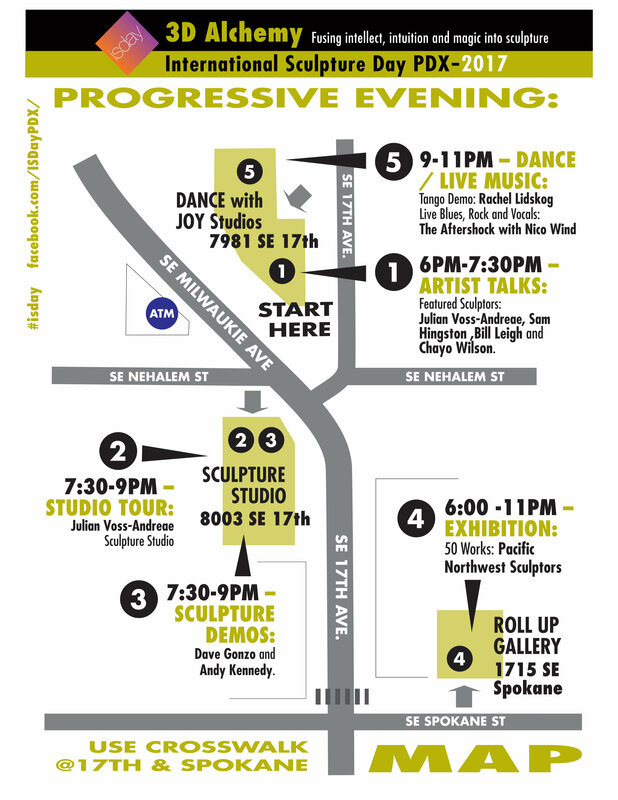 Here is the map of the Progressive Evening’s festivities. at Roll Up Gallery, April 21 & 22. Finishing the evening with Dance! I can’t wait to dance to the Aftershock this Saturday night!! What a great way to finish our IS Day PDX evening event, with the rich and lovely vocals of Nico Wind backed by incredibly skilled Portland musicians!! Many of you know that Blues music sends me into flight, so you’ll know where to find me – on the dance floor at 9:30 pm. See you there!! !